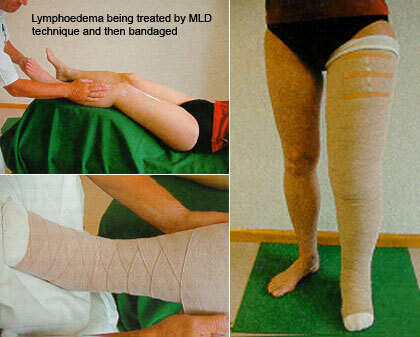 Lymphoedema is term which is used to describe swelling caused by the retention of lymphatic fluid. It occurs most commonly in the limbs but it can occur in any part of the body. It is important to note that swelling can occur for different reasons and therefore it is important that lymphoedema is diagnosed by a qualified medical practitioner. Lymphoedema can be classified as primary or secondary and this classification is dependent on the cause. Primary lymphoedema is caused by abnormal functioning of the lymphatic system. Sometimes this is present at birth or it may develop later in life. It can run in families. Secondary lymphoedema occurs when the lymphatic system has been damaged. This may occur after surgery, cancer, radiotherapy treatment or recurrent infections or trauma. Initially it is vital that lymphoedema is correctly diagnosed and assessed to determine if possible the actual reason for the swelling in case there is a serious underlying cause. If no serious underlying cause is identified patients are often referred to a specialised clinic to undergo a course of treatment with manual lymphatic drainage and correctly fitting compression hosiery by qualified practitioners. Manual lymphatic drainage is a specialised massage technique that is designed to move fluid out of the tissues of the affected areas. Compression is applied to help to prevent the swelling building up again. Good skin care is also very important to keep the skin and tissues in as good a condition as possible. Keeping lymphoedema at its lowest possible level may require lifelong care.